Some results from our 2015 Student ICT Survey at the Faculty. A bit of background: The CreATE Team has run a survey of all Faculty students twice, in 2013 after I started working here and again this year (2015) in March. Our survey is based largely on the ECAR survey run by Educause out of the States. We have reduced the number of questions and reformatted them to make sense for the Kiwi tertiary context but end up with results that allow us to benchmark with other universities (they produce excellent reports and graphics from their findings). Result from our 2015 Faculty of Education survey: First off, were had an excellent participation rate, 655 students took the time to engage with the survey and 596 students completed every question. The median age for participants was 25. The gender breakdown matched enrolment figures at 83% female and 17% male. And the ethnic composition was consistent percentage-wise with our most recent student intake in 2015. We had input from students in every degree programme (except for two) and every year (both undergraduate and postgraduate). The response to the first question of our survey was incredible, 99% of the survey participants own at least one Internet capable device. This could be a desktop, laptop, tablet or smartphone. A laptop was the most commonly owned device (93%) and a smartphone (90%) a very close second. Most impressive is the result that 90% of our students own two or more of these devices (with a laptop/smartphone combo being the most popular). Additionally, 97% of the participants indicated that they had Internet access from home. Of those with home Internet access, a very high proportion (92%) indicated their access was specifically at broadband speeds, 3% indicated a dial-up speed connection, and 7% were unsure. There were a number of other questions but some of the most interesting revolved around the importance or perceived value that these devices had for them. A lot of factors play into this ‘value’ result, whether you are a postgraduate student versus an undergraduate, in an initial teacher education degree programme, or whether the staff that teach courses in specific degree programmes include learning activities and assessments that leverage student device ownership. 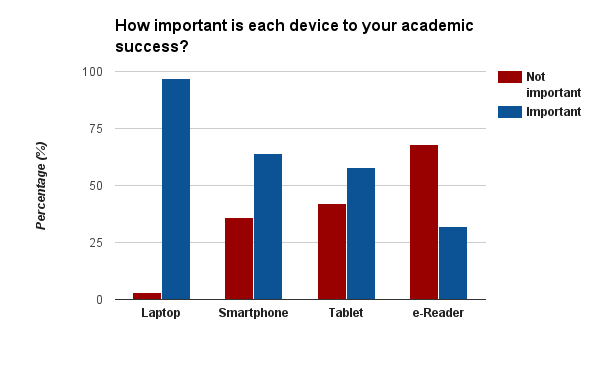 Clearly, our survey participants highly value owning a laptop and perceive this device as critical to their academic success. There is work for us around ensuring our students see their smartphones as equally valuable in the classroom, a change to the new LMS will help as will any upgrades in the network and wireless infrastructure on campus. Tablets are another story, with only 50% of our students owning a tablet device and the common perception being that they are primarily for fun (eg, a Netflix screen or gaming device), changing that idea will be challenging. Finally, from our results it clear that we can stop thinking about e-Readers as an academic tool, student ownership is very low at ~10% and perception of their value for academic success is also very low. Promoting the services that do exist at the Faculty better. For instance, ensuring all students know about the Info Commons computers in the Library, the computer labs on Level 4 in N-Block, the laptop loan programme in the Library, and the desktop computers available in the various Student Success Centres would be simple to promote. Additionally, improving hours of access to any of these facilities to better support demonstrated student need is an easy question to ask. Arranging for a lease-to-own laptop programme with a third party provider is something that has been achieved elsewhere and will allow those students with financial constraints to spread the costs effectively of a couple of years. However, the most important consideration is ensuring all our teaching staff are challenging every student in every course to use and leverage the devices they own in appropriate ways and constantly building or adding to their digital literacy skills. The upskilling of staff might be the most difficult of all these issues in that it requires academic staff to continually upgrade their skills through some type of professional development. That takes time and its the one commodity that we all seem to lack the most.